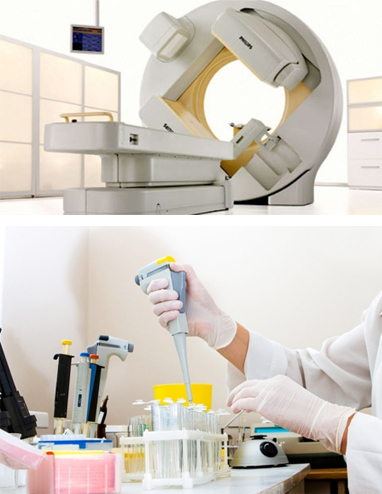 Nuclear medicine involves the use of radiopharmaceuticals. These consist of a specially designed molecule attached to a radioactive atom, which loses radioactivity within a short period of time and usually leaves the body within 24 hours. Different radiopharmaceuticals (or tracers) have been developed to study or treat different organs in the body, so depending on the condition that is being diagnosed or treated, the appropriate tracer will be administered to the patient – usually by IV injection. The tracer emits energy known as gamma rays (similar to X-rays) – which are then detected by special scanners known as single photon emission computed tomography (SPECT) – , positron emission tomography (PET) – or gamma cameras. These scanners detect the movement and accumulation of a tracer in the body’s organs to produce a picture of the disease in the organs. In treatment, a high energy tracer is used, which accumulates in the tumour being treated and irradiates it from the inside. Nuclear medicine cameras move across the body and rotate around it to produce 2D or 3D images of the body. They are quiet and cause no discomfort and unlike conventional radiology, they do not transmit any beams through the body. Conventional radiology (X-rays, ultrasound, CT and MRI) usually demonstrates the structure (anatomy) of a patient’s organs. Organs can however be diseased without a change in structure. Nuclear medicine demonstrates the function (physiology) of the organs by showing the uptake and excretion of a tracer (radioactive dye) by the actual cells. It can therefore often detect disease at a much earlier stage than imaging the organ anatomy. A recent development is the so-called “hybrid scanner”: a combined gamma camera/CT scanner. The scanner allows fusion of a 3-D nuclear medicine scan (SPECT) with a low-dose CT scan done at the same time. This technique is called SPECT-CT and allows much more accurate interpretation of images.